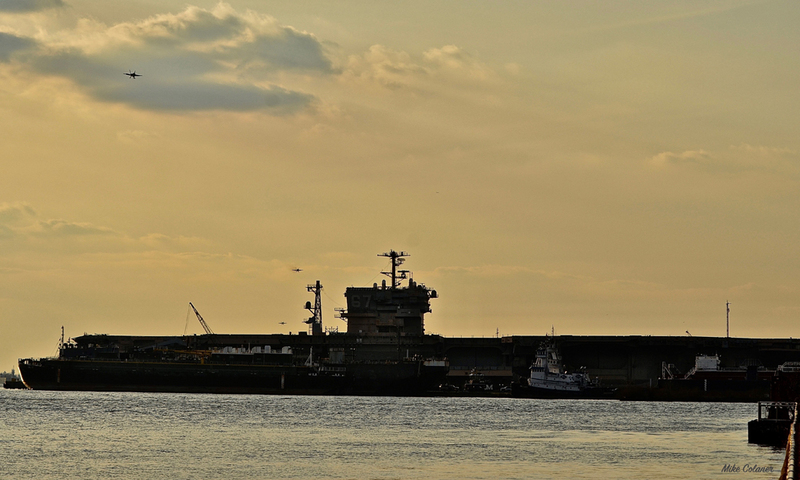 On Friday February 1, 2019 a rare sundown had occurred at 1303 hours at the U.S. Navy’s East Coast Master Jet Base, Naval Air Station Oceana. 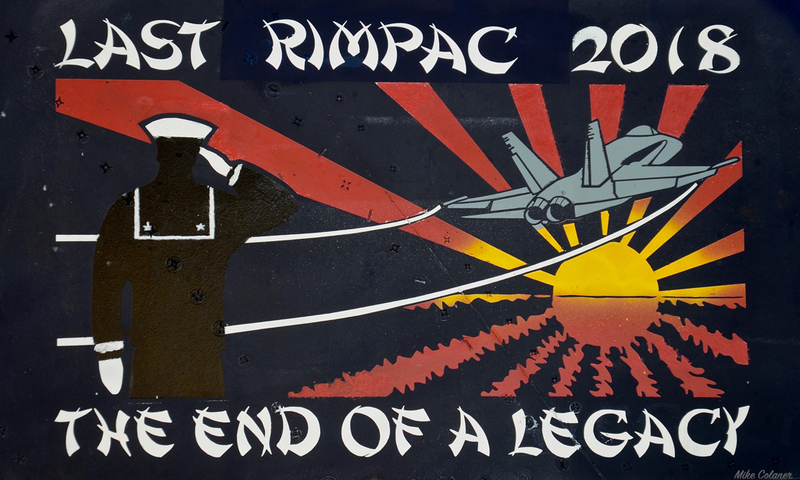 This sundown had not come early because this was for the U.S. Navy’s F/A-18C ‘Legacy’ Hornet and this event was over 40 years in the making. As of this day, no longer will the Navy deploy or use this aircraft in combat. 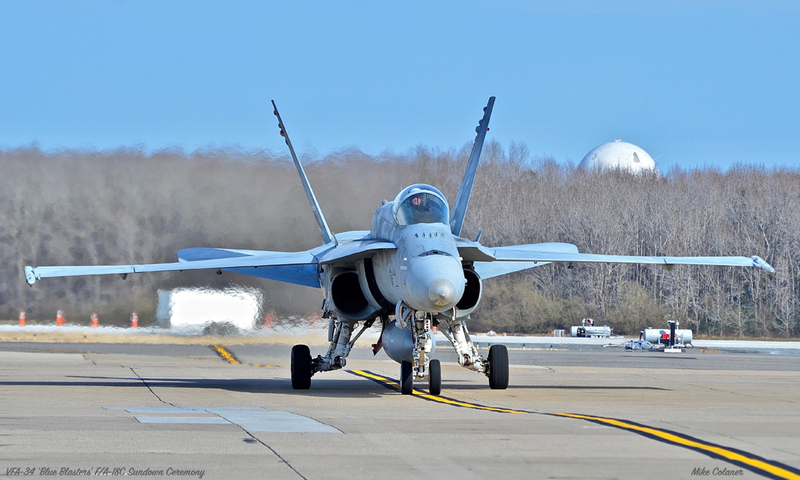 The ‘Legacy’ Hornet will remain in U.S. 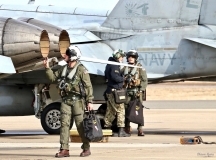 Naval service with one reserve VFA squadron, one Naval Reserve Fighter Composite Squadron (VFC-12), the Navy’s Flight Demonstration Squadron (the Blue Angels) and the Naval Aviation Warfighting Developmental Center, but its days of front line service with the U.S. Navy have now passed. 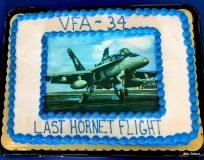 The ‘Legacy’ Hornet sundown occurred as the Commanding Officer of Strike Fighter Squadron Three Four (VFA-34) the ‘Blue Blasters’, U.S. Navy Commander Will ‘Fathead’ Mathis shut the engines down on F/A-18C , MODEX 434 / Buno 165399 for the final time. 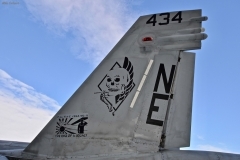 The ‘Blue Blasters’ have the distinction of writing the final chapter of the F/A-18C ‘Legacy’ Hornet into the operational Navy squadron history book. 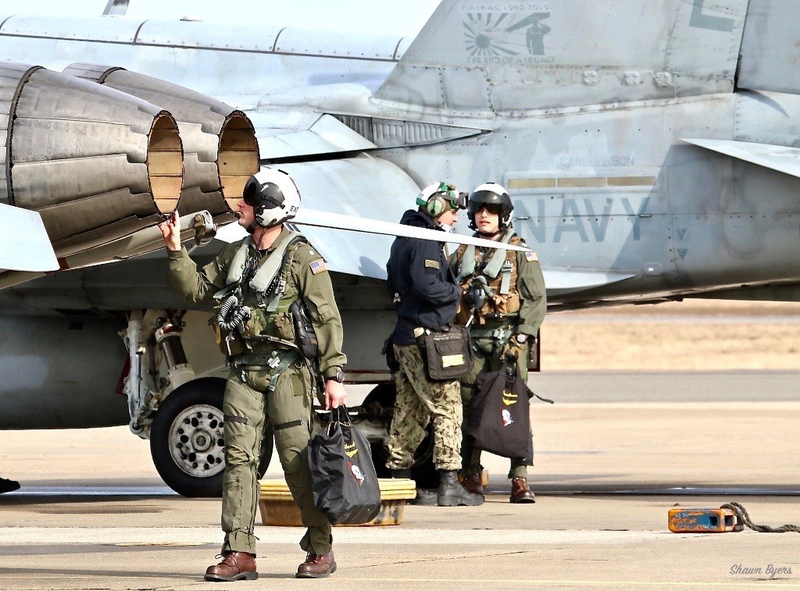 However, that did not happen before VFA-34 sent their beloved F/A-18C out in style by living up to their squadron motto, “Have gun….Will travel”. 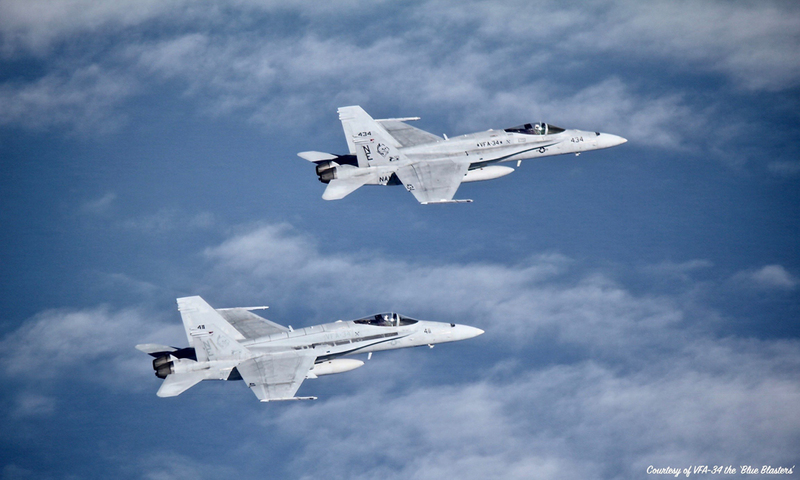 In 2016 the Navy had decided VFA-34 would be the final operational Navy squadron to transition from the ‘Legacy’ Hornet to the ’Super’ Hornet. 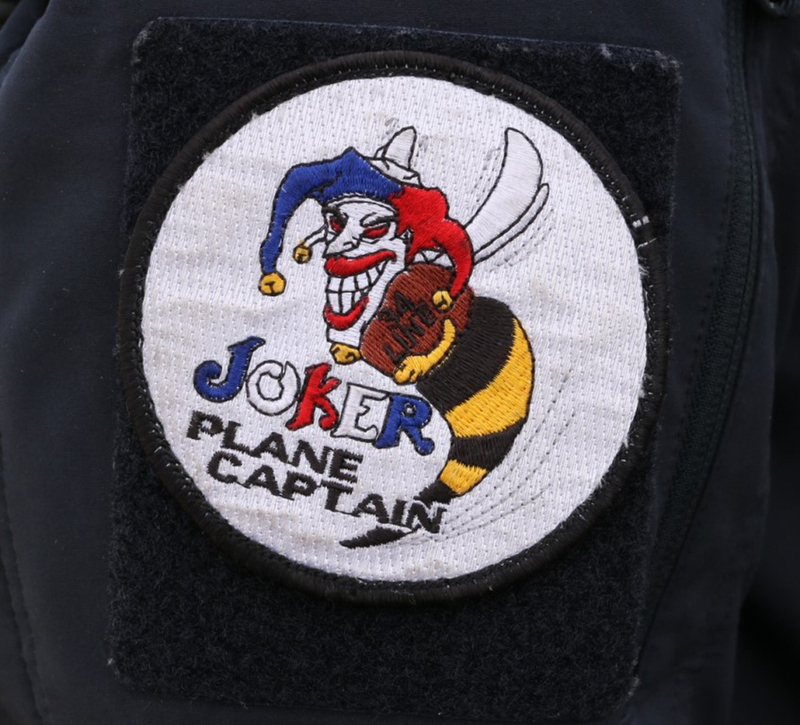 As such the ‘Blue Blasters’ were given the pick of the fleet’s ‘Legacy’ Hornet airframes to transfer into their squadron. 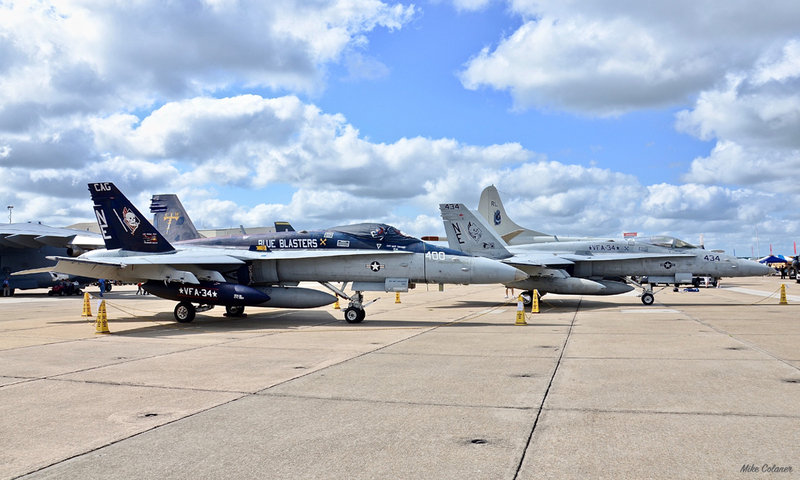 They also were given all the funding and parts they needed to keep their ‘Legacy’ Hornets flying and to maintain their mission readiness until early 2019. 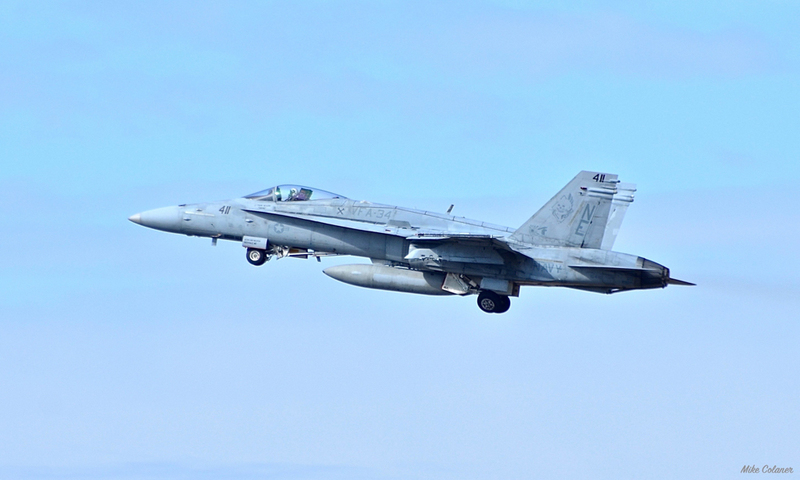 The ‘Legacy’ Hornet sundown tour began over a year ago with VFA-34 deploying as part of Carrier Air Wing 2 aboard the USS Carl Vinson (CVN-70). They participated in the 25 Nation Rim of the Pacific exercise (RIMPAC 18) which included a historic port of call visit to Vietnam. This marked the first visit by a U.S. Navy carrier to the country since the end of the war in 1975. 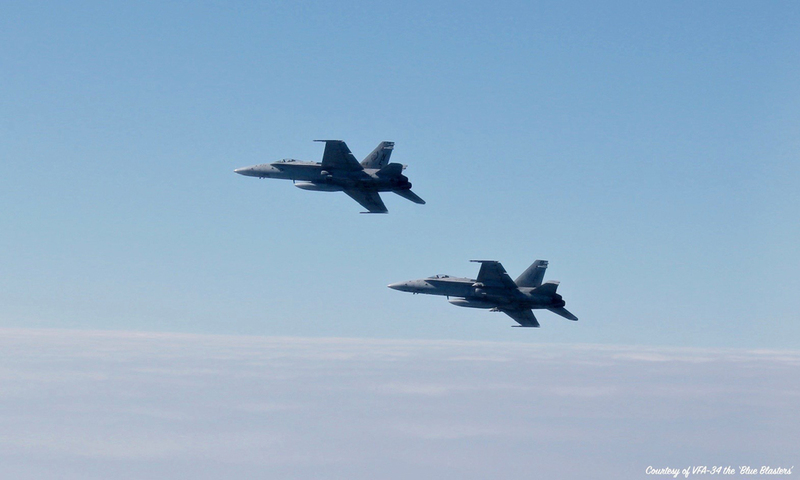 The ‘Blue Blasters’ next took part in a sustainment exercise off of the coast of California aboard the Carl Vinson. 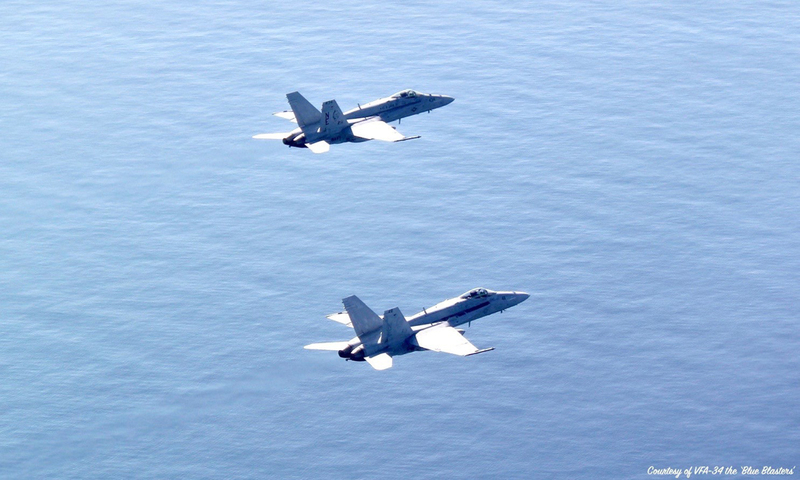 This exercise marked the last time a U.S. Navy ’Legacy’ Hornet would deploy aboard a U.S. Navy carrier. 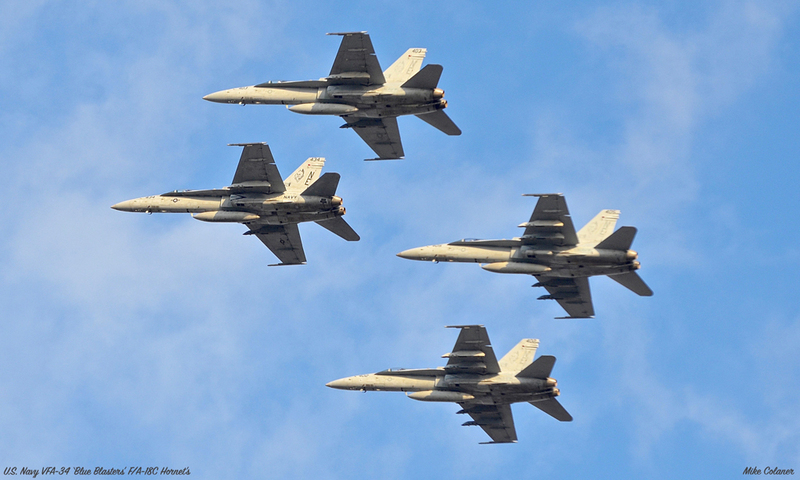 The Navy honored the ‘Legacy’ Hornet’s many years of service with one last flyover of the Army Navy game in Philadelphia. The ‘Blue Blasters’ were selected to conduct the flyover. The prestige of being selected to pilot one of the aircraft for the Army Navy Game goes to the squadron’s Naval Academy graduates. Piloting the lead aircraft was VFA-34 Commanding Officer, Commander Will ‘Fathead’ Mathis, USNA Class of 2000. The wing aircraft were piloted by Lieutenant Commander Thomas ‘Nuker’ Kilcline, USNA Class of 2008, Lieutenant Casey ‘Edgyr’ Murdock, USNA Class of 2012 and Lieutenant Charles ‘Sky Lord’ Johnson, USNA Class of 2013. 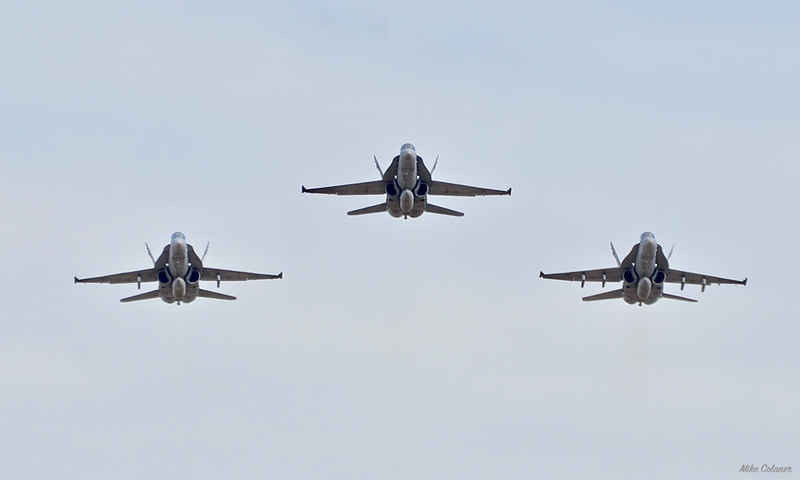 Upon completing the flyover, the ‘Blue Blasters’ overflew the Philadelphia Naval Yard and the USS John F. Kennedy (CVN-67) on their return to Philadelphia International Airport. 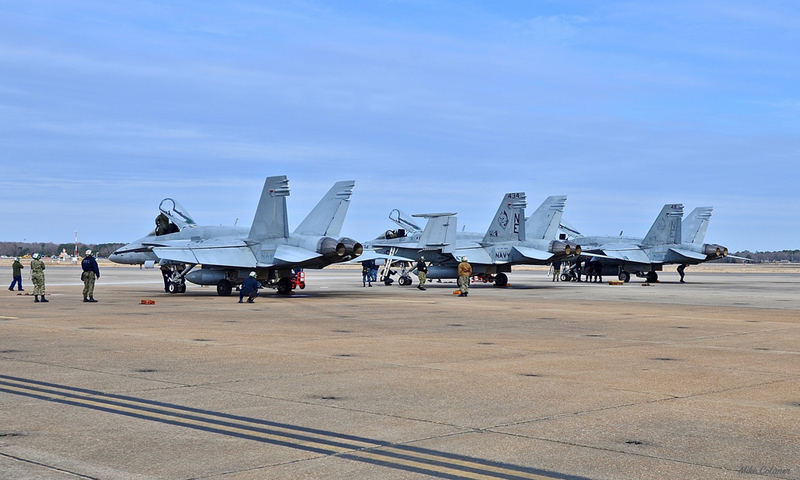 Shortly after my arrival at NAS Oceana for the ‘Legacy’ Hornet sundown ceremony I was escorted to the VFA-34 hanger in time to witness Commander Will “Fathead” Mathis, Lieutenant Commander Ben "D-Rex" Orloff and Lieutenant Frank "Boomtown" Mcgurk walk to their awaiting aircraft. After their walk around inspection it was time to to climb aboard. Soon the engines were turning, systems were checked and F/A-18C’s Buno’s 165399, 165175 and 164411 officially were taxiing away and took off. 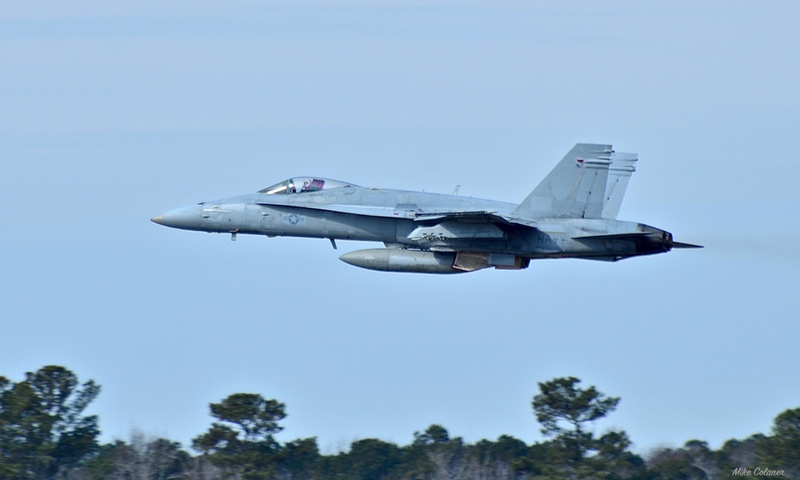 The sundown flight lasted approximately 75 minutes and was conducted approximately 80 - 100 miles southeast of NAS Oceana over the Atlantic Ocean in the whiskey seven two (W-72) training area. 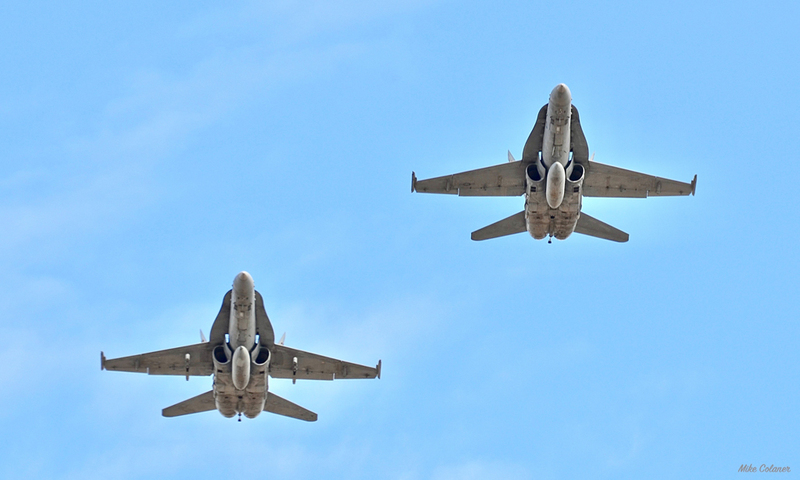 With the five minute warning given, everyone began to scan the skies for three aircraft. Tally ho was called as they appeared three abreast and head on to their hanger. 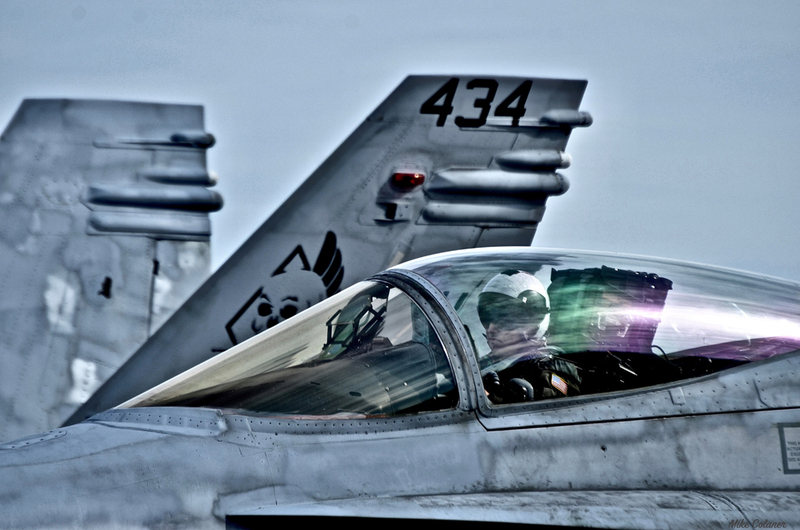 As they approached their ramp Lieutenant Commander Orloff conducted a left break for landing. 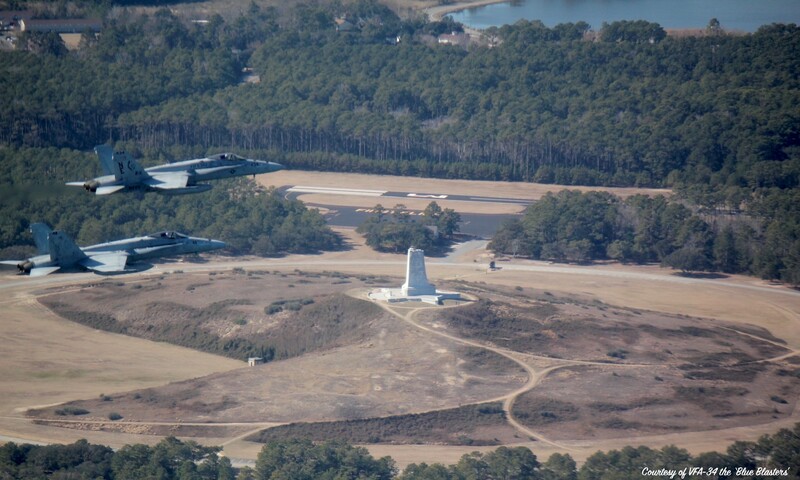 Commander Mathis and Lieutenant Mcgurk soared directly overhead before they each made their break for landing. 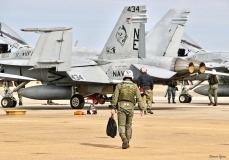 The three aircraft then were recovered and taxied back to the VFA-34 ramp. 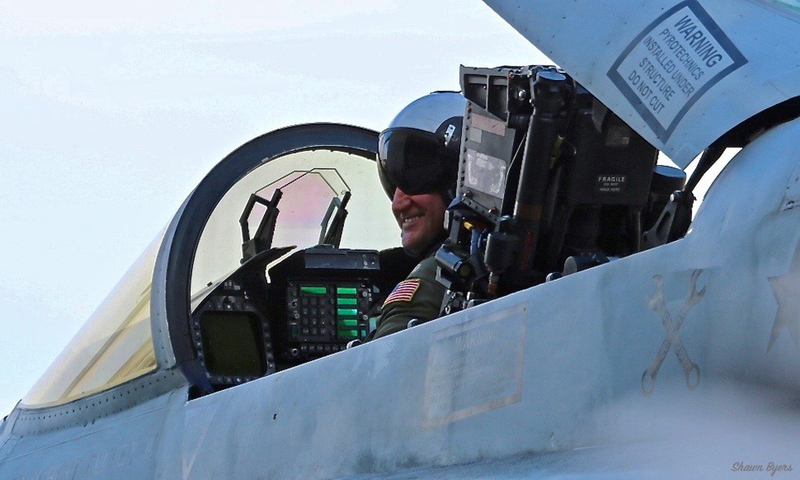 Commander Mathis taxied his aircraft to the open hanger doors and shut down the engines before a large crowd of family, friends, guests and squadron members. He then climbed out of the aircraft where he was surrounded by his squadron members for handshakes, smiles and photos. Commander Mathis proceeded to the podium where he gave this valediction speech which he shared. 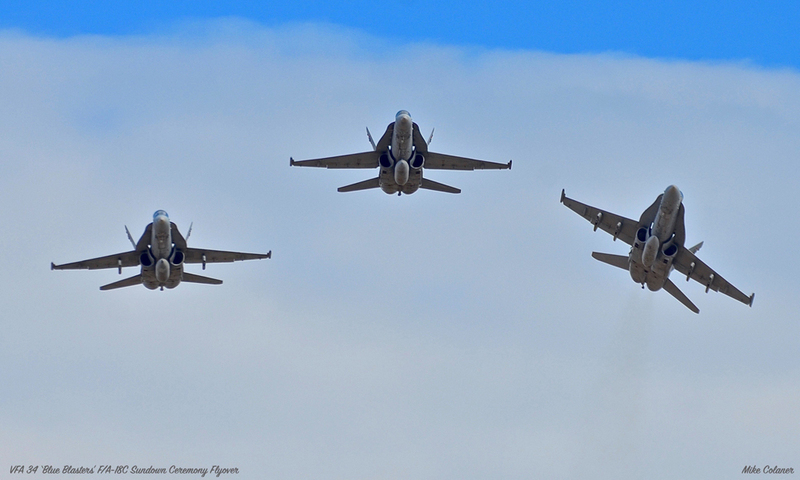 Good afternoon everyone and thank you for coming to celebrate the Last Flight of the Legendary F/A-18C Hornet. 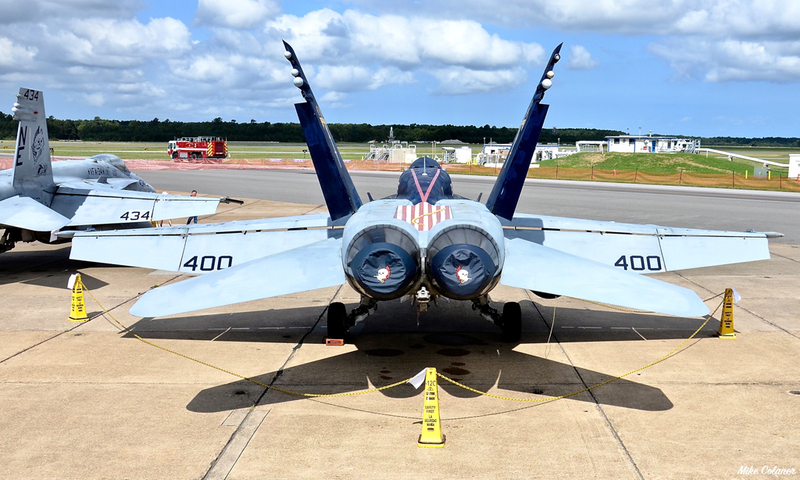 Born over 40 years ago, the Hornet entered operational service for the US Navy in 1984. For the next 35 years, she proudly served the nation from the flight deck of aircraft carriers in all the seas across the globe. 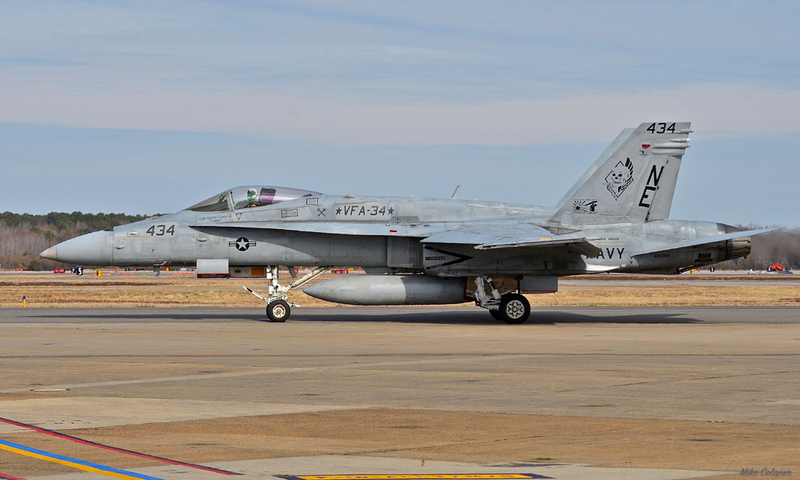 The Hornet first saw combat action in 1986 while conducting operations against Libyan air defense sites in Operation El Dorado Canyon. 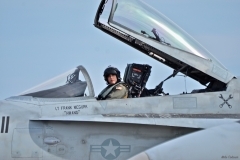 She continued to serve in every major US military operation to include the Gulf War, Iraqi War, Bosnian and Kosovo War, Enduring Freedom, Iraqi Freedom, and Inherent Resolve and is credited with two air-to-air kills. 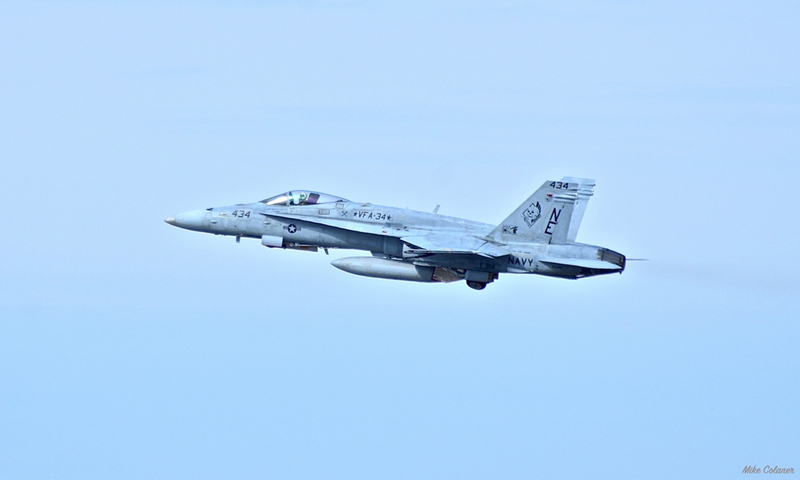 The F-18 Hornet most recently served in 2018 from the deck of the CARL VINSON with VFA-34 while conducting Freedom of Navigation patrols in the South China Sea. The Hornet is known as many things. Legacy, highly reliable, multi-role attack fighter, often low on gas, susceptible to hard landings or the dreaded 904. And recently prone to pressurization issues. But to us, she will always be an old friend. 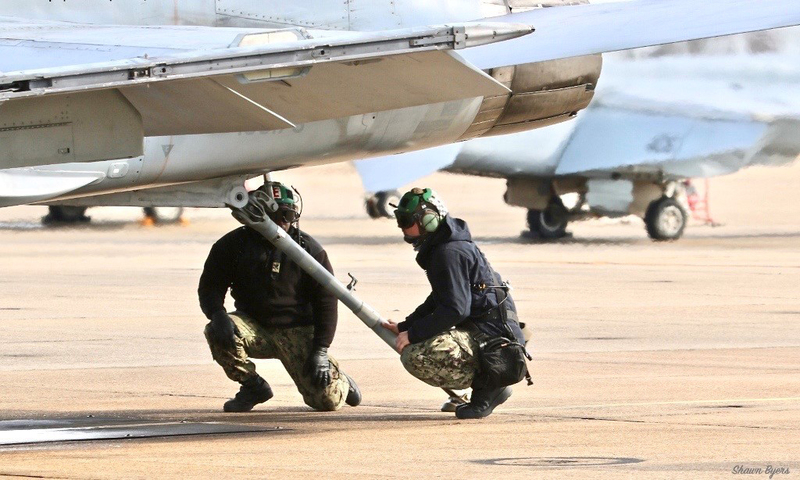 The Hornet will continue to serve with the Marine Corps and with Navy support units, but for the operational Navy it is time to say goodbye. 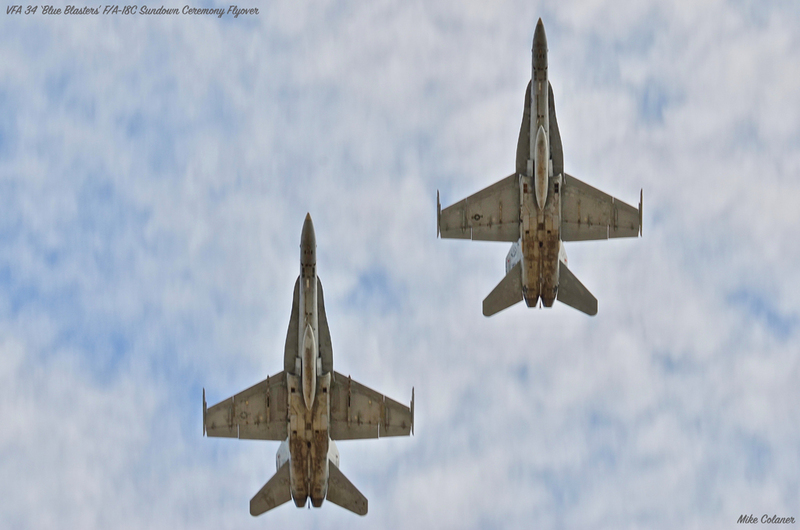 So, from the men and women who flew and maintained the “Legendary” F-18 Hornet, we say thank you for your service and job well done!! I spoke with Commander Mathis about what his plans were for the sundown flight and how he planned to mark this special occasion. "For the flight, we wanted to capture as much as we could in photos so we were looking for a nice backdrop. The original plan was to fly to NYC and fly by the Statue of Liberty, but we ran into issues with the Government shutdown. Then we considered looking for a carrier to fly-by and we had permission from the USS Lincoln, but the ship was too far away. So we ended up going out to the warning area and taking some formation shots and then flew over Kitty Hawk." 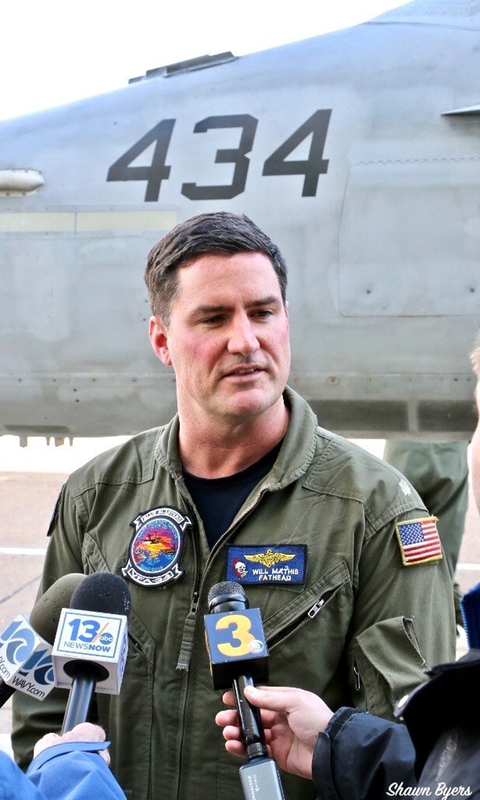 "I’m really proud to be a part of the last chapter of an aircraft that did so much good work for the U.S. Navy. I’ll tell future generations that I flew this aircraft. That’s a neat thing to say, but also I feel a little old being that the plane I flew is being retired." 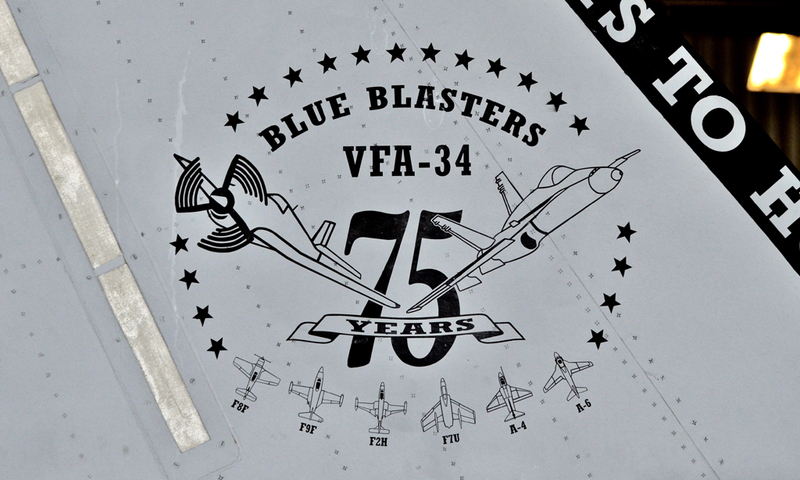 The ‘Blue Blasters’ have only a handful of ‘Legacy’ airframes still on hand. These aircraft will be ferried to California and accepted by the U.S. Marines in the upcoming days. 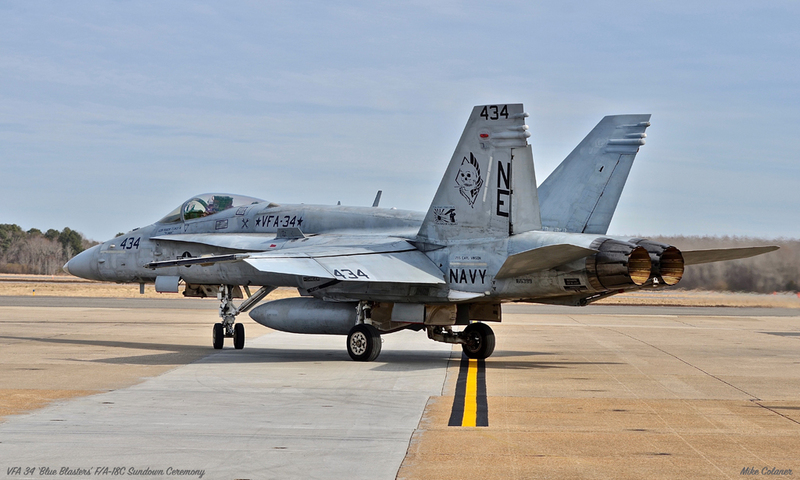 The retirement of the Navy F/A-18C airframe will be short lived. 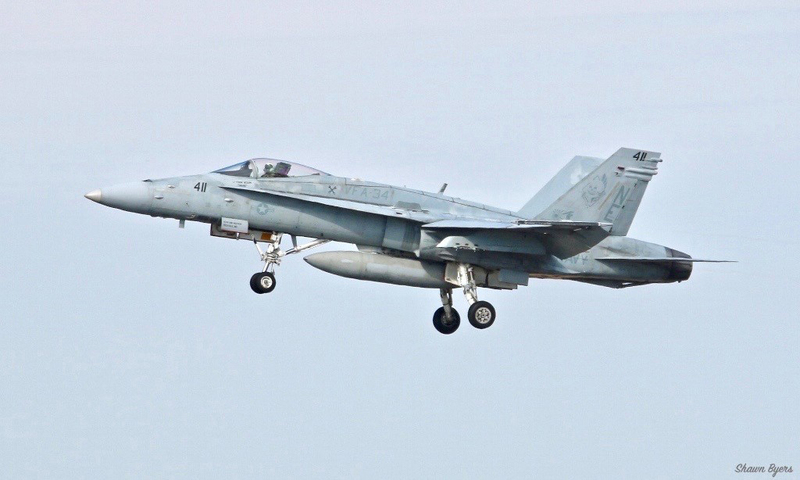 The ‘Blue Blasters’ hornets are desperately needed by the U.S. Marine Corps and the Navy has already been passing them along to their sister service. 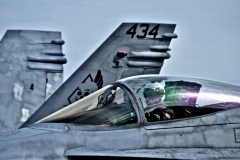 The Marines are expected to make various upgrades to the ‘Legacy’ Hornets including a new AN/APG-79(V)4 AESA radar. 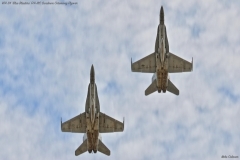 The Marines are expect to keep the last of these airframes flying until the year 2030. The maintainers are expected to complete their transitional training to the ‘Super’ Hornet in the near future. 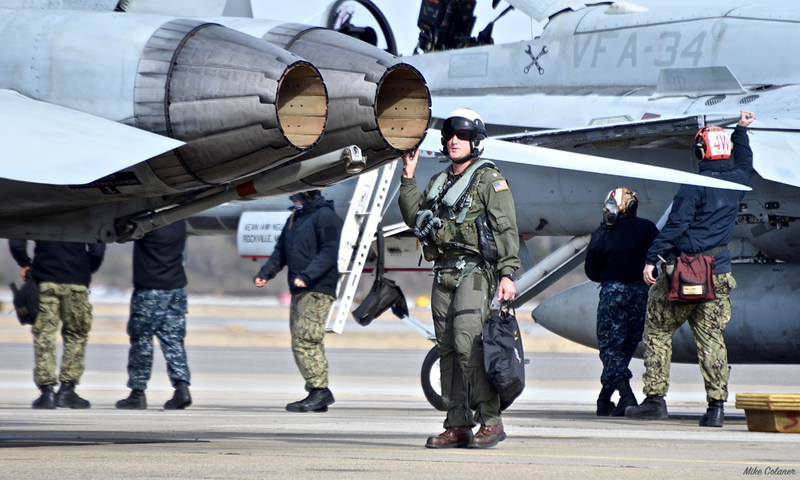 The VFA-34 aviators will go through a training period with Fleet Replacement Squadron One Zero Six (VFA-106) to become NATOPS certified on the ‘Super’ Hornet. 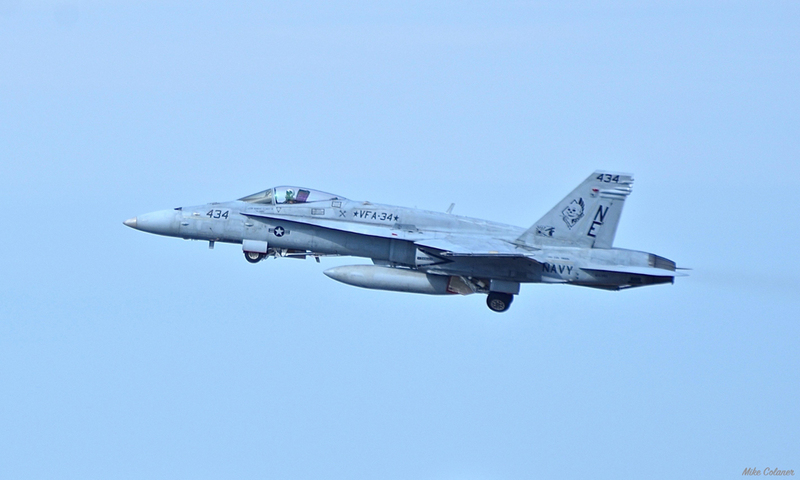 And if all of that wasn’t a busy and full year, VFA-34 was just recognized and has received the U.S. Navy Safety ’S’ award. 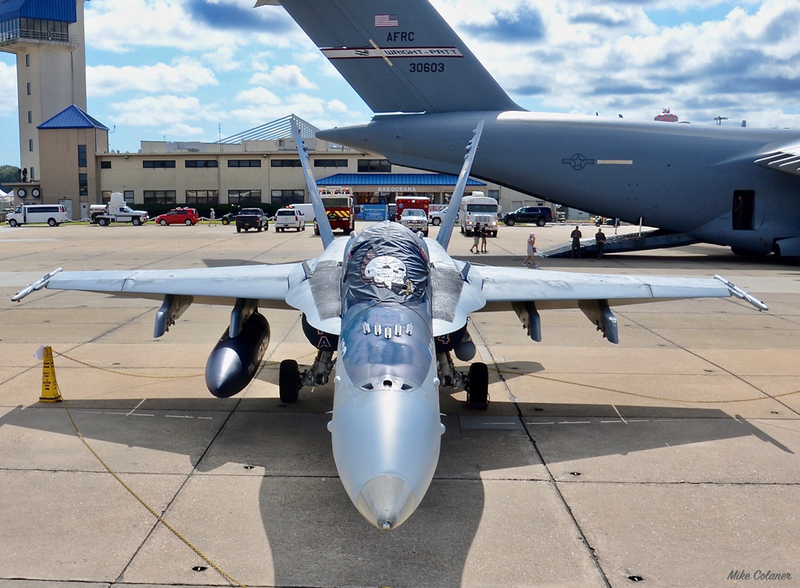 Moving forward, VFA-34 has already received their first brand new F/A-18E ‘Super’ Hornet from Boeing’s St.Louis plant and has put it into the paint shop. Stay tuned for the first photos! 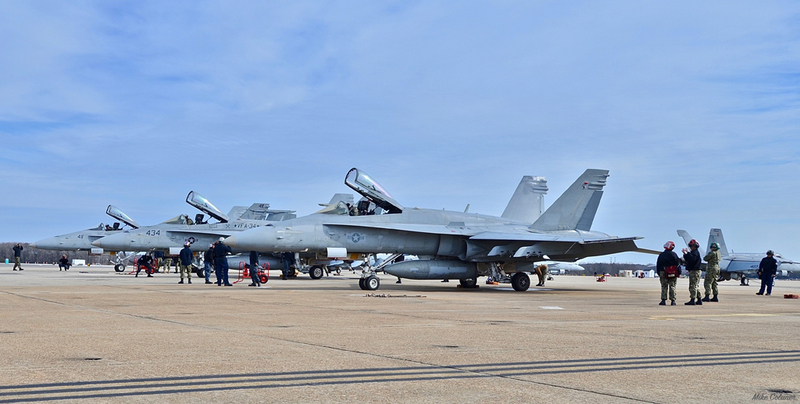 I would like to thank VFA-34 the ‘Blue Blasters and Mike Manus of the NAS Oceana Public Affairs Office for all of their assistance and access to this historical event. Thanks to Photorecon’s Shawn Byers for helping me with this story. I especially would like to thank Commander Will ‘Fathead’ Mathis for being such a gracious host and for all of his assistance and clearing the Photorecon team of myself and Shawn Byers to attend this historical event. Commander Mathis provided us with exclusive access, content and photos. This article couldn’t have been accomplished to the level it has without him “clearing us hot” for this ceremony. 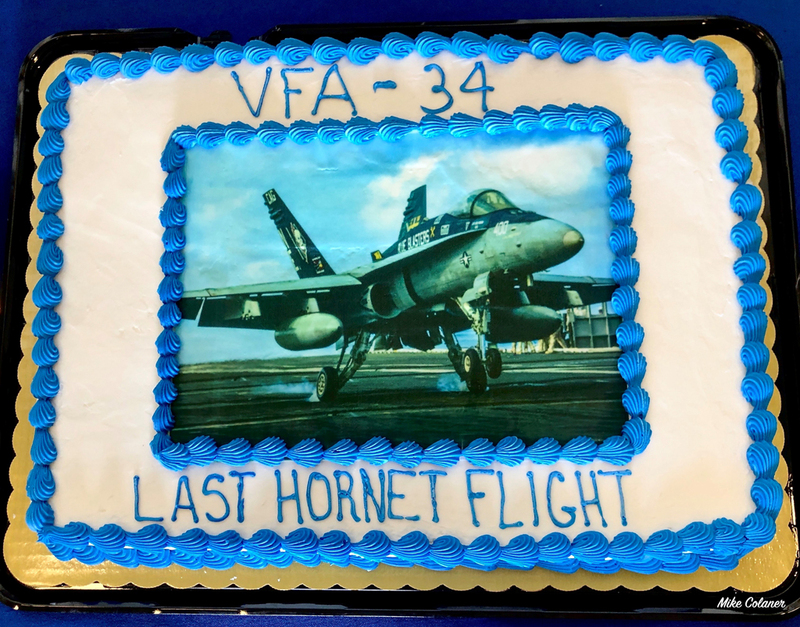 Thank you and Bravo Zulu VFA-34 ‘Blue Blasters’ on sending the ‘Legacy’ Hornet on its well deserved retirement from operational U.S. Navy squadrons!